"One million" redirects here. For other uses, see One million (disambiguation). Look up million in Wiktionary, the free dictionary. In scientific notation, it is written as 7006100000000000000♠1×106 or 106. Physical quantities can also be expressed using the SI prefix mega (M), when dealing with SI units; for example, 1 megawatt (1 MW) equals 1,000,000 watts. Information: Not counting spaces, the text printed on 136 pages of an Encyclopædia Britannica, or 600 pages of pulp paperback fiction contains approximately one million characters. Fingers: If the width of a human finger is 2.2 cm (7⁄8 in), then a million fingers lined up would cover a distance of 22 km (14 mi). If a person walks at a speed of 4 km/h (2.5 mph), it would take them approximately five and a half hours to reach the end of the fingers. 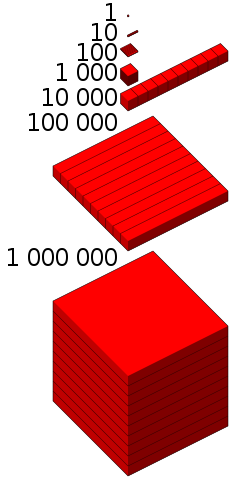 Volume: The cube root of one million is one hundred, so a million objects or cubic units is contained in a cube a hundred objects or linear units on a side. A million grains of table salt or granulated sugar occupies about 64 ml (2.3 imp fl oz; 2.2 US fl oz), the volume of a cube one hundred grains on a side. One million cubic inches would be the volume of a small room ​8 1⁄3 feet long by ​8 1⁄3 feet wide by ​8 1⁄3 feet high. Weight: A million 80-milligram (1.2 gr) honey bees would weigh the same as an 80 kg (180 lb) person. Landscape: A pyramidal hill 600 feet (180 m) wide at the base and 100 feet (30 m) high would weigh about a million tons. Computer: A display resolution of 1,280 by 800 pixels contains 1,024,000 pixels. Money: A USD bill of any denomination weighs 1 gram (0.035 oz). There are 454 grams in a pound. One million USD bills would weigh 2,204.62 pounds (1,000.00 kg), or just over 1 ton. Time: A million seconds is 11.57 days. In Indian English and Pakistani English, it is also expressed as 10 lakh or 10 Lac. Lakh is derived from 'laksh' for 100,000 in Sanskrit. 1,771,561 – 116, also, Commander Spock's estimate for the tribble population in the Star Trek episode "The Trouble with Tribbles"
Orders of magnitude (numbers) to help compare dimensionless numbers between 1,000,000 and 10,000,000 (106 and 107). ^ "million". Dictionary.com Unabridged. Random House, Inc. Retrieved 4 October 2010. ^ "m". Oxford Dictionaries. Oxford University Press. Retrieved 2015-06-30. ^ "6.7 Abbreviating 'million' and 'billion'". English Style Guide. A handbook for authors and translators in the European Commission (PDF) (2019 ed.). 26 February 2019. p. 37. ^ "M". Merriam-Webster. Merriam-Webster Inc. Retrieved 2015-06-30. ^ "Definition of "m"". Collins English Dictionary. HarperCollins Publishers. Retrieved 2015-06-30. ^ Averkamp, Harold. "Q&A: What Does M and MM Stand For?". AccountingCoach.com. AccountingCoach, LLC. Retrieved 25 June 2015. ^ Sloane, N. J. A. (ed.). "Sequence A059925 (Initial members of two prime quadruples (A007530) with the smallest possible difference of 30.)". The On-Line Encyclopedia of Integer Sequences. OEIS Foundation. Retrieved 2019-01-27. ^ a b "Sloane's A093112 : a(n) = (2^n-1)^2 - 2". The On-Line Encyclopedia of Integer Sequences. OEIS Foundation. Retrieved 2016-06-17. ^ a b "Sloane's A093069 : a(n) = (2^n + 1)^2 - 2". The On-Line Encyclopedia of Integer Sequences. OEIS Foundation. Retrieved 2016-06-17. ^ a b "Sloane's A007629 : Repfigit (REPetitive FIbonacci-like diGIT) numbers (or Keith numbers)". The On-Line Encyclopedia of Integer Sequences. OEIS Foundation. Retrieved 2016-06-17. ^ a b c "Sloane's A001599 : Harmonic or Ore numbers". The On-Line Encyclopedia of Integer Sequences. OEIS Foundation. Retrieved 2016-06-17. ^ a b c "Sloane's A000129 : Pell numbers". The On-Line Encyclopedia of Integer Sequences. OEIS Foundation. Retrieved 2016-06-17. ^ a b c d e "Sloane's A000045 : Fibonacci numbers". The On-Line Encyclopedia of Integer Sequences. OEIS Foundation. Retrieved 2016-06-17. ^ "Sloane's A001110 : Square triangular numbers". The On-Line Encyclopedia of Integer Sequences. OEIS Foundation. Retrieved 2016-06-17. ^ a b "Sloane's A004490 : Colossally abundant numbers". The On-Line Encyclopedia of Integer Sequences. OEIS Foundation. Retrieved 2016-06-17. ^ a b "Sloane's A002201 : Superior highly composite numbers". The On-Line Encyclopedia of Integer Sequences. OEIS Foundation. Retrieved 2016-06-17. ^ a b c "Sloane's A001190 : Wedderburn-Etherington numbers". The On-Line Encyclopedia of Integer Sequences. OEIS Foundation. Retrieved 2016-06-17. ^ Sloane, N. J. A. (ed.). "Sequence A181098 (Primefree centuries)". The On-Line Encyclopedia of Integer Sequences. OEIS Foundation. Retrieved 2019-01-27. ^ "Sloane's A094133 : Leyland primes". The On-Line Encyclopedia of Integer Sequences. OEIS Foundation. Retrieved 2016-06-17. ^ "Wolstenholme primes". The On-Line Encyclopedia of Integer Sequences. OEIS Foundation. Retrieved 2016-06-17. ^ a b "Sloane's A001006 : Motzkin numbers". The On-Line Encyclopedia of Integer Sequences. OEIS Foundation. Retrieved 2016-06-17. ^ a b "Sloane's A000108 : Catalan numbers". The On-Line Encyclopedia of Integer Sequences. OEIS Foundation. Retrieved 2016-06-17. ^ "Sloane's A000979 : Wagstaff primes". The On-Line Encyclopedia of Integer Sequences. OEIS Foundation. Retrieved 2016-06-17. ^ "Sloane's A000058 : Sylvester's sequence". The On-Line Encyclopedia of Integer Sequences. OEIS Foundation. Retrieved 2016-06-17. ^ "Sloane's A005165 : Alternating factorials". The On-Line Encyclopedia of Integer Sequences. OEIS Foundation. Retrieved 2016-06-17. ^ "Sloane's A000110 : Bell or exponential numbers". The On-Line Encyclopedia of Integer Sequences. OEIS Foundation. Retrieved 2016-06-17. ^ "Sloane's A088165 : NSW primes". The On-Line Encyclopedia of Integer Sequences. OEIS Foundation. Retrieved 2016-06-17.